If your sky is clear early Sunday evening (April 17), be sure to look up to the southeast about an hour or so after sundown for a stunning cosmic duet. There, more than halfway up in the southeast sky you'll find an eye-catching sight: You'll immediately see the moon, which will be at its waxing gibbous phase, 85 percent illuminated, en route to becoming full during the overnight hours late Thursday night (April 21) to early Friday morning (April 22). But on this particular Sunday evening, you'll also notice a very bright, silvery "star" shining with a steady glow to the left or upper left of the moon. That's not a star: it's the biggest planet in our solar system, Jupiter. Moon and planet will keep each other company as they move across the night sky through the course of the night. Jupiter is ideally placed for evening viewing, shining high and free of trees and other obstructions, and where even the distorting effect of the atmosphere is at its least. Jupiter currently shines in the constellation Leo. It reaches its highest point in the sky — transiting the meridian, as the astronomers would say — soon after 10 p.m. local time, and it sets during the predawn hours, around 4:40 a.m.
For amateur astronomers, Jupiter is the best of the planets; a superb telescopic object. Its disk shows more illuminated surface area than all the other planets combined. Users of the very smallest telescopes or even steadily held binoculars can identify some (or all four) of Jupiter's bright moons at any time. But the planet's disk itself also draws a lot of attention. In large telescopes one can view its cloud belts; sometimes one or more can look strongly disturbed, full of knots and sprouting festoons or on the other side of the coin, perhaps looking like pale belts crossing the planet. 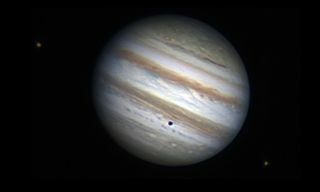 Observing from Cebu, Philippines, Christopher Go, an assiduous watcher of Jupiter, recently described the famous Great Red Spot as "well resolved" with a dark core and containing dark streaks and tiny ovals. As always, seeing much detail on Jupiter requires a good quality telescope, good atmospheric seeing and patience behind the eyepiece. Finally, if clouds hide your view of the moon and Jupiter on Sunday, don't fret. They'll be together again on May 14.